Santa Monica — Sept. 29, 2014 – DoorBot, the company who first introduced the Wi-Fi enabled video doorbell that streams live video and audio of a home’s front doorstep directly to a smartphone or tablet, today announces its latest device, the Ring™ Video Doorbell. This is the first product released under the company’s new brand, Ring. The Ring Video Doorbell was built from the ground up to provide consumers with unprecedented convenience, monitoring, and security for their homes. 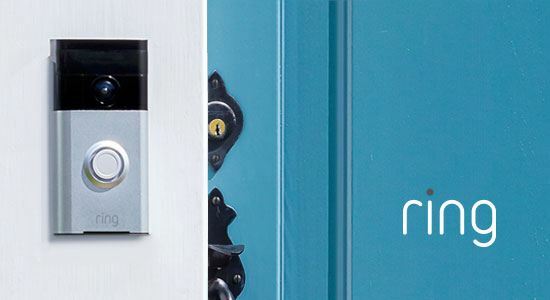 Ring provides convenience by notifying homeowners of any visitors while also allowing them to communicate with arriving guests through their mobile device. According to data from The Federal Bureau of Investigation–in The United States alone–over 1 million home burglaries occur during daytime hours when homes are unoccupied. Ring provides the appearance of being home, deterring potential burglars by empowering consumers to protect their home from anywhere. The Ring Video Doorbell not only communicates with visitors through a smartphone or tablet, but also includes motion-triggered mobile notifications, an HD camera with night vision, and cloud recording which will capture all activity from the front of the home. Ring owners can view the captured footage through their mobile device via the free Ring app. The Ring™ Video Doorbell is currently available for pre-order for $199 at www.ring.com. Assests: Ring Video, photo 1, photo 2, photo 3, photo 4. Mobile Access- Receive instant alerts when someone rings your Video Doorbell or motion is detected, via the free Ring app for iOS and Android. See and speak with visitors from anywhere using your smartphone, and watch recorded footage anytime thanks to cloud recording. Dual Power- Dual power capability makes the Ring Video Doorbell perfect for any home. Power your Video Doorbell through your existing doorbell wires, or wirelessly operate the Ring Doorbell with its internal, rechargeable battery. Easy Installation- Set up your device in minutes with no professional help or special tools required. Everything you’ll need is provided in the box. Powerful Motion Detection- Not everyone rings the doorbell, so we’ve included intelligent motion sensors to alert you of activity in front of your home. Any movement triggers an alert via the Ring app and activates the night vision HD camera. HD Camera- Always have a clear view of your home’s entrance with wide-angle HD video. Night Vision- Benefit from around the clock coverage thanks to infrared LEDs. Cloud Recording- Captures all activity at your home and allows you to view it on your own schedule. Two-Way Communication- Seamlessly speak with anyone at your door via the built-in speakers and microphone. Certified for Outdoor Usage- Never worry about your unit being damaged by heat, humidity, rain, sleet, or snow. Lifetime Purchase Protection- The Ring Doorbell securely attaches to its mounting plate using a proprietary screw. If your device gets stolen, don’t worry–we’ll replace it free of charge. Custom Faceplate Finishes- Choose from four different finishes and match your Ring Video Doorbell to your door’s hardware. Available in brushed aluminum, antique brass, venetian bronze, and polished brass. Ring’s mission is to reduce crime in communities and empower consumers by creating a ring of security around individual homes and neighborhoods. With Ring you’re always home, helping to prevent crimes from occurring even if a homeowner is away. The company’s first product, the Ring™ Video Doorbell, offers homeowners convenience and flexibility through motion-triggered mobile notifications, an HD camera featuring night vision, and cloud recording. Ring is the evolution of Doorbot, the first Wi-Fi enabled video doorbell. For more information visit: www.ring.com. Ring’s mission is to reduce crime in communities and empower consumers by creating a ring of security around individual homes and neighborhoods. With Ring you’re always home, helping to prevent crimes from occurring even if a homeowner is away. The company’s first product, the Ring Video Doorbell, offers homeowners convenience and flexibility through motion-triggered mobile notifications, an HD camera featuring night vision, and cloud recording. Ring is the evolution of Doorbot, the first Wi-Fi enabled video doorbell. For more information visit: www.ring.com. DoorBot announces company rebranding, new smart Wi-Fi enabled video doorbell. The Ring Video Doorbell features advanced motion detection and cloud recording. Ring Video Doorbell built from ground up as a new way to monitor your home.